Texas-based Cielo Wind Power has developed their own approach to wind power projects-called the "Wind Ranch"-which has a strong focus on protecting the farm and ranch land the company uses to build commercial scale wind power plants. In his close to 20 years in the wind power business, Cielo Wind Power President Walter Hornaday has seen tremendous growth in wind power-and there's much more to come, he says. During that time, the Austin, Texas-based company that Hornaday heads up has gone from repairing small wind turbines to being part of a joint venture that wants to build one of the largest wind farms in the United States. This past fall, Cielo Wind Power announced that it had joined in a joint venture with the U.S. Renewable Energy Group and China's Shenyang Power Group with plans to build a $1.5 billion, 600MW wind ranch across approximately 36,000 acres in Texas. The company has indeed come a long way from the early 1990s and a 6,000 square foot office/shop in an industrial warehouse in south Austin. Ten years later, Cielo Wind Power moved to a downtown office with lots of glass and, as Walter Hornaday puts it, "a fancy elevator." This year, the company erected a prototype Samsung wind turbine in Lubbock, Texas, with a fancy elevator of its own. This past December, Cielo Wind Power and U.S. Renewable Energy Group entered into a definitive agreement with Shenyang Power Group to develop a $1.5 billion 600 MW wind farm in Texas, which would make it among the largest wind power projects in the U.S. The project will be financed by Chinese banks and will use 240 turbines made by a subsidiary of China's Shenyang Power Group, A-Power Energy Generation Systems, Ltd.
"There seems to be a bullish interest on the part of Chinese sources of capital to fund wind power development," says Cielo Wind Power President Walter Hornaday. "We provided them with a project that would give them a platform to invest in wind power in the U.S." Traditionally, the funding for developing U.S. wind power has come from the U.S. and Europe. But Hornaday noted there was a pause to that during the current recession. It's fortunate, he says, that Chinese companies entered the picture with financing for the 600 MW Texas project. "Otherwise the project would not be moving ahead." The fact that the turbines will be supplied by a Chinese manufacturer generated a bit of a political storm in the U.S. But Hornaday said that regardless whose name is on the turbine, he expects the majority of the turbine will be made in the U.S.
Cielo Wind Power has been busy in recent years, especially in the booming Texas wind power market. The company-the largest privately held wind power project development company in the U.S. Southwest-says it has developed upwards of 20 percent of all the installed wind turbines in Texas. Development and construction of wind power projects is what Cielo Wind Power does-and that is all that it does, Hornaday emphasized. The small group of 20 employees at the company has managed every phase of the development, construction, and operations of wind power projects, large and small. Hornaday himself entered the wind business with a strong engineering and construction background in power and industrial projects, having worked for major construction and engineering companies Bechtel, Morrison Knudsen, and Jacobs Engineering. "When we started Cielo Wind Power, we had an idea how we could take the skill set we had on organizing complicated engineering, construction, and operations projects and apply that to wind power." The company had humble beginnings in that small shop in south Austin. They started out doing repairs on defective wind turbines-as small as five kW up to 40 kW. "This work involved equipment where the original manufacturer of the turbines had gone bankrupt or there were serial problems with a line of turbines," explains Hornaday. In the 1980s, there was a big move towards small wind turbines, notably in California. That demand was met by both U.S. companies and Danish companies, some of which produced less than reliable equipment. They were often unable to meet their warranty requirements, and some companies just walked away from their wind turbine equipment. This left these small turbine owners high and dry. But it also created an opportunity for Cielo Wind Power. "Some of the turbines were plain unfixable, but we were in the business of picking that handful of turbines that we could get operating reliably, and that's how we started the company. "We then took that know-how and effectively applied it to these small one to four turbine projects scattered around Texas, Oklahoma, and New Mexico, essentially bringing dead wind projects back to life." They established a reputation for being the "go-to guys"-they could take crackpot wind projects and make them work properly. "We did that for many years," says Hornaday. 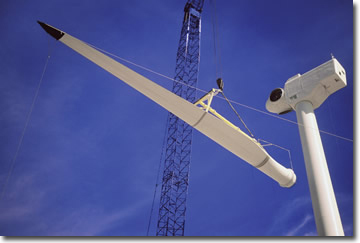 The wind turbine manufacturing industry evolved, especially in the mid-1990s, and so did Cielo Wind Power. Turbine manufacturers started making more reliable equipment, so much so that a company could go to a bank or institutional investor and fund a project since there was proof that the equipment would operate reliably for years. "It was kind of a turning point, with the industry trying to clean up the problems of the past and move towards solid wind power projects that were financially conservatively organized. That's when we started doing projects with scale." The leaders in the move to more reliable turbine equipment were, no big surprise, the Danish companies. "A handful of Danish companies were making some very high quality wind turbine equipment. They were operating in a subsidized home market, and in that protected market, they were able to make reliable equipment." It was a bit of a tipping point, says Hornaday. "Things changed as soon as the equipment was reliable. Instead of approaching projects with the idea that you need to have your investment paid back in three years because you didn't know if it was going to work, you could have conservative, long term paybacks on turbines because you knew they were going to last that long." From the start, Cielo Wind Power has worked to set itself apart in the market. Hornaday talks about the first commercial scale project they took on in Texas, in 1998. "We wanted to differentiate ourselves as a company," he explains. "We went out and canvassed the regulatory environment throughout the U.S. and tried to find the tightest regulations that could apply to wind projects. And then we looked at regulatory requirements in Texas and how companies operate there." They have developed their own approach and standards, which they call the "Wind Ranch"-they've even trademarked it. The Wind Ranch focus is on preserving and protecting the farm and ranch land the company uses to develop commercial scale wind power plants. Before the development of the company's first large project, Cielo Wind Power created and implemented a list of rules to preserve the integrity of the land, and they require all contractors to follow these rules throughout the construction process and the life of a wind lease. For example, all equipment is to be washed before entering the project site to keep noxious weeds--such as African root and bitter weed-from being introduced. Cielo Wind Power replaces and restores fences and cattle guards during construction of a project. They also create better roads and bury power lines underground to reduce the project's environmental footprint. Hornaday says Cielo Wind Power continually works to improve the aesthetics and efficiency of each project by collaborating with the FAA to minimize the number of lights installed and lower the visual impact of the turbines. Over the course of 20 years, Austin, Texas-based Cielo Wind has gone from repairing small wind turbines to being part of a joint venture that wants to build one of the largest wind farms in the United States. The company also follows the lead of some Texas oil and gas developers, who do double ditching, where the topsoil is pulled aside with one pass of the excavator, and the rocky material is pulled in a second pass. The layers of material are then placed back exactly as they were before. Essentially, Cielo Wind Power both adopted existing best practices and developed their own. "We have a written schedule of the practices that we promise to the landowners," says Hornaday. "In our leases, we say contractually we will be good stewards of the land, and we put these same requirements in all our contracts with the contractors who are doing the work on site for us." And they carefully oversee their projects. "A key part of the process is that our management staff keeps a close eye on projects as they are built, and as a result, we have projects that have very light footprints. If you were to visit a site a few months after the dust has settled on construction, you'd see a project that truly lives up to what wind is supposed to be: the most environmentally sensitive way we can generate electricity." This business approach costs more, says Hornaday, but it's worth it. "We could make a little higher fee on a project, but that's kind of near-sighted. You want to look at the long term benefits. We're also able to insulate ourselves from regulation that might tighten up on wind projects, and separate ourselves from bad actors in the industry." They take pride in having the ability to work closely with landowners-even a large number of landowners. Their first utility scale project involved some 150 landowners. "It takes really good organization skills to get 150 different people on the same page for a project," recalls Hornaday. Some of the 150 were scattered all over the U.S. and did not even know they owned land. "So we were tracking people down, making phone calls informing them that they owned land in West Texas, and asking if they would be interested in hearing about what we'd like to do on that land for wind power," says Hornaday. "That's continued to be a forte for us: we have the capabilities to organize even difficult landowner footprints for projects." Trust is a big part of the company's relationship with landowners, he says. "Part of the development process is when landowners give a company like us time to organize a project. So there is a certain amount of trust or faith you put in that company, that they are going to show up with a project. "That's certainly one of the things landowners have to look at-not just the "what if" terms of a contract, but how much confidence you have in a company that they are going to complete that project. It can be a difficult job for landowners to sort out who they are going to do business with." Illustrating the financial reward that wind power development can deliver to landowners, the company tracks on their website-on a per second basis-how much money has been paid to landowners on company-developed wind power projects. In mid-May, that number stood at close to $142 million. In terms of wind project owners, Cielo Wind Power brings solid engineering expertise to the table, says Hornaday. "We have a good focus on engineering the risk out of a project through a well managed engineering, procurement, and construction program," he explains. "We spend a little bit more money on engineering and specifying the project at the start. And we make decisions on specifying equipment based on the long term operating interest of the project, not just the capital program." The most recently completed project was the 150 MW Goat Mountain Wind Ranch for the Edison Group. The project, built in two phases on an 11,000 acre site in West Texas, has 80 Mitsubishi 1 MW and 29 Mitsubishi 2.4 MW turbines. The construction contractor for the project was Wanzek Construction. 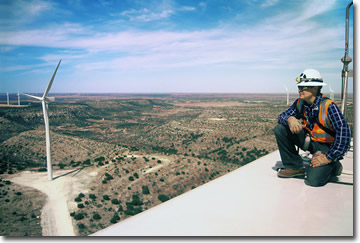 In Texas in particular, the company has the luxury of building wind projects on mostly flat land-and Goat Mountain was a good example of that. "Generally, we do projects on fairly flat terrain so we don't have to spend a lot of time figuring how to get turbines on the edge of cliffs like they do in other parts of the country," says Hornaday. The company has completed a large number of wind power projects, but each one is still unique, he adds. "It's a moving target," says Hornaday. "As the turbines get larger, the requirements on the roads to access the site get more difficult, and it's getting more difficult to get from turbine site to turbine site on the project." In Texas, Oklahoma, and New Mexico, he notes, they have the benefit of 120 foot long oil rigs regularly travelling the roads-and under the overpasses. "The roads in those states can more easily accommodate moving the turbines, but larger turbines are starting to exceed the size of oil rigs."